Tulamben, Bali is a little village in the northeast coast of Bali, the beach is black sand covered by smooth, fist-size rocks. The remains of Gunung Agung exploding in 1963 has sent the lava flows along this coastal area. There is a bay here that invites divers to visit this village to explore under water scene. The bay was later known as Tulamben Bay amongst the divers. The excellent diving sites in Tulamben, Bali are Ship Wreck (USAT Liberty Cargo), Paradise Reef and Drop Off (actually rugged wall). These sites are the best beach entry scuba diving in all of Bali, further east about 15 minutes cruising in a small out rigger fishing boat, will bring you to other diving sites known as Alamanda Reef and Batu Kelebit. A car ride 10 minutes further west of Tulamben and you will be in Kubu village with its beach similar in condition to Tulamben Bay offers a diving on the pristine Kubu Reef. Just 30 meters from the beach at Tulamben, Bali is a World War II cargo ship broken up but still an impressively large wreck, stretching 120 meters long on a steeply sloping sandy bottom. The top of wreckage is just 3 meters below the water surface and the bottom is at 29 meters. January 11th, 1942, this ship was hit by torpedoes from Japanese submarine I166 while crossing the Lombok Strait carrying rubber and railroad part on World War II service. The damage was critical, but two destroyers hitched up to the ship and tried to tow it to the port at Singaraja. The wounded cargo ship was taking too much water, however and her crew ran the vessel up on the beach at Tulamben. The volcanic explosion of Gunung Agung in 1963 rolled Liberty off the beach to its present location, in the process breaking in pieces. The wreck is completely covered with variety of corals and hundreds of species of fish inhabit it, an Australian Rudie Kuiter, author of the definitive guide to Indonesian reef fishes, estimates that some 400 species of reef fishes live on the wreck, which is also visited by perhaps 100 species of pelagic. This is a remarkable number for an area just 120 meters long. On the slack tide is a good time to do night dive, remarkable flashlight fishes (Anomalops katoptron) in the black corals at the bow blink the like starslight in the sky. Visibility is average 15 to 20 meters and water temperature is roughly warm 28 to 29 degrees C.
This is one of Bali’s ‘must do’ dive sites. Tulamben dive site is where the shipwreck is found. This World War II ship is just teeming with sea life which is why it is a favorite for photography divers, coupled with very little current, which makes this dive site suitable for all levels of diver. 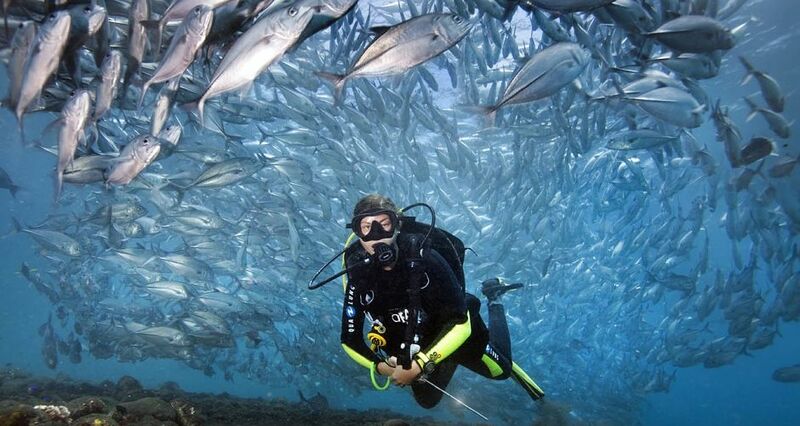 Here we usually find a large school of Jacks circling above the wreck and a resident Barracuda.